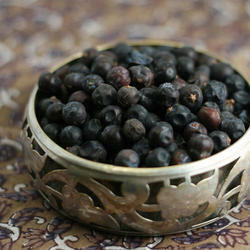 Being a foremost organization in this industry, we are actively engaged in offering the finest quality Juniper Berries. We, as an organization have integrated with professional expertise which enables us to supply and export a premium range of Fresh Juniper Berries. High nutritional value due to the rich presence of vitamins and minerals, these Juniper Berries are cultivated using high quality seeds and natural fertilizers under the supervision of our agricultural experts. We bring forth qualitative Fresh Juniper for our valued clients. Hygienically processed, these herbs are in conformance with the defined parameters of the industry. Our products are available with us in different quantity proportions addressing diversified demands of the clients. We are providing Juniper Berries to the clients that are used to make the juniper Oil. Usage/Application: Heartburn,Kidney and bladder stones, Joint and muscle pain.